One of the best French bistros by a comfortable margin, Kiki's executes standards --- plus so much more --- with rousing results. 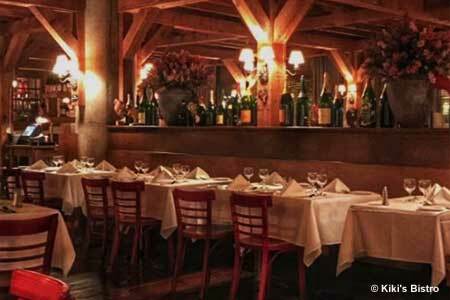 : This is easily one of the best bistros in Chicago. Quiet and civilized, Kiki's is a French country inn in spirit. Nothing seems to escape the eye of proprietor Georges Kiki Cuisance, whose steadiness extends to his sharply dressed waitstaff. We can honestly say that we have never had a bad meal here, or that service has not been topnotch. We favor the daily fish specials as well as the steak frites, bouillabaisse, salade lyonnaise and, for dessert, the crème brûlée --- the chocolate on the bottom adds a particular panache. You’ll find most every bistro staple, from duck confit and incomparable coq au vin to steak au poivre and frogs’ legs, but you’ll also encounter other rustic choices like lamb stew loaded with turnips, potatoes and carrots. Wines are fairly priced. Enjoy wine flights and cheese plates in the bar in the evening when you’re in the mood for a snack.